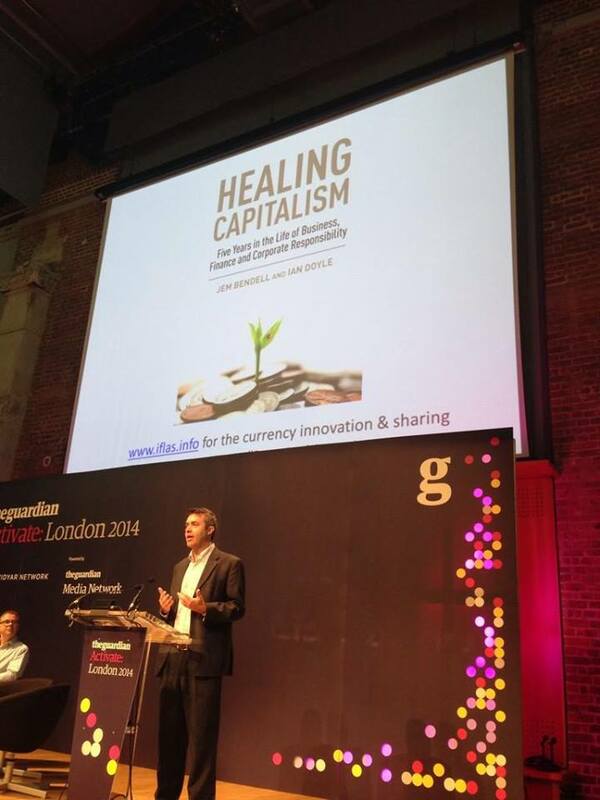 Today I spoke at the Guardian newspaper’s Activate conference in London. The audience was mostly comprised of VCs, Financial Tech specialists, Sharing Economy start ups, and others interested in the potential of tech to disrupt the way we pay and co-rent. Here, below, is the text of the speech. “Thanks for the introduction, Stephen. Yes, I founded at an institute for leadership and sustainability, in the Lake District. A land known for hiking, sheep, poetry, rabbits… and bitcoin. Earlier this year we became the first public university to accept the crypto currency. We decided to accept bitcoin to learn by doing, as we teach a Masters-level course on currency innovation. In the course we explore how currency systems and sharing platforms might help sustain our communities and environment. But what Ive come to understand is that if we want to shape the future of money then first we must understand the present nature of money. So before I tell you what I’m excited about, let me explain what I’m grumpy about. About 97% of money we use is created by private bank lending, which comes with interest. When we borrow, the money is created by the bank, not taken from savings. The amount owed to banks, which is the amount borrowed plus the interest, is always more than the amount borrowed. It means that collectively we are in debt forever, so inequality is inevitable. With this system of money creation, banks decide who gets the new money and for what. So about 80% of new money is created for property loans. That inflates the price of property, so house prices are 8000% higher than in 1950. That’s not market forces, but the result of our monetary system. I know many people who are in jobs they hate, or who have ignored a vocational calling, because of the mortgage. Some people I know have got ill because their mortgage locks them into a certain lifestyle. Unless we start out with a lot of capital, it’s less a property ladder than a property prison. I take inspiration from a South African anti-apartheid campaigner. In the 1970s Tim Jenkin was imprisoned for 12 years for his activism, to be served in a high security jail in Pretoria. Given the injustice of the system Tim considered it his duty to try to break out of jail. Which he did after 18 months, and fled the country. Fast forward to 2003, Tim had returned to South Africa. He saw that people are oppressed by the current monetary system, and he wanted to free them. He created Community Exchange Systems with free open source software. They now have 50,000 users, in over 700 locations worldwide. Instead of units of ‘money’ being issued into circulation according to a policy or algorithm, peers extend credit to each other. It means people who have little money but have time, skills and resources, can start helping each other and trading with each other, without official money. This is “collaborative credit” as it involves members of a network trusting each other rather than a bank. Collaborative credit doesn’t come with interest demands or create asset price inflation. There are over a thousand such systems worldwide, but they are largely under the radar of the media, VCs or philanthropists. Bitcoin has opened minds the idea that fintech can help us transact in alternative currencies, but there’s a long way to go. Now we need to understand how currencies can be designed to support communities and the environment. Bitcoin fans often speak of financial freedom, yet the issuance and distribution of bitcoin makes Thatcher look like a communist. Moreover, it is delusional to believe that money should be a thing of value, rather than a way of keeping score amongst people and organisations doing useful things for each other. We can’t eat money, we can’t eat gold, we can’t eat bitcoin. The real wealth is our lives, communities and environment. We need currency systems that support such wealth, not undermine it. We need positive transformation of our monetary systems, not just disruption. People like Tim Jenkin have launched collaborative credit systems without financial backing. Now fintech and sharing economy start-ups have a role to play, but to do so they need to design business models that will empower people not make them captive. I hear some people in fintech and the collaborative economy looking to exit to a major multinational. That might let their founders and shareholders escape the prison of the mainstream monetary system, but leave that prison with new walls and stronger guards. You can download the introduction to Healing Capitalism for free. This entry was posted on July 17, 2014 at 11:19 am	and is filed under Academia and Research, Sustainable Development, Talks. Tagged: bitcoin, collaborative credit. You can follow any responses to this entry through the RSS 2.0 feed. You can leave a response, or trackback from your own site.